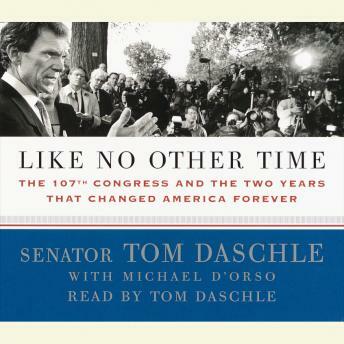 Tom Daschle, the Majority Leader of the historic 107th Senate, presents a candid insider’s account of the workings of the U.S. government during two of the most tumultuous years in the nation’s history. The 107th Congress faced a time like no other in the life of the nation. This was the era of the first presidential election to be decided by the United States Supreme Court, the fifty-fifty Senate, the horror of September 11, the anthrax attacks on media and the government (including Daschle’s own office), the war on terrorism, corporate scandals that shook the economy, the inexorable move toward war with Iraq, and other dramatic events, all leading up to the historic midterm elections of 2002. Through it all, Senator Tom Daschle had, with the exception of the President, the most privileged view of these unfolding developments, both in front of and behind the closed doors of government. In Like No Other Time, Daschle offers a riveting account of his singular perspective on a time when the nation faced deadly and elusive external enemies and a level of domestic political contention rarely seen in American history. Senator Daschle is un-flinching in his impressions of the key political figures of our time from both parties. The result is an acutely perceptive assessment of how our government met—and sometimes did not meet—the challenges of a remarkable era. As it was during the years of the 107th Congress, the United States is once again at a critical and historic crossroads. Our choices, based on what we have learned from our recent past, will affect our future in profound ways. For Senator Daschle, the first and perhaps most important choice lies with what kind of representation and leadership we want in government. It is a choice between a political party with a core philosophical belief in the power of our collective will to confront these challenges through our government, and one dominated by a group of people who don’t like and don’t believe in government.